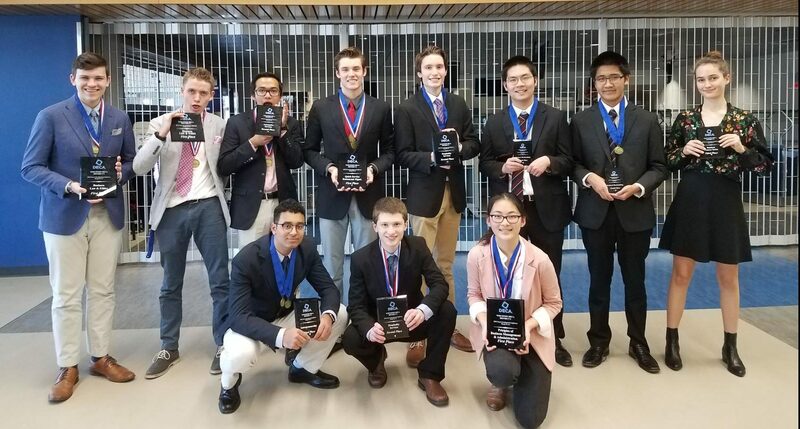 During finals week, Homestead students traveled to the Wisconsin State DECA competition where they competed in their individual categories with their hopes set on international competition. Each delegate competed in two different role plays and took one test based on their category. Categories include marketing, finance, entrepreneurship, hospitality and tourism. Some delegates also participated in DECA projects and presented them in front of judges. This could include working with a local business and doing marketing consulting or coming up with an original innovative business idea and presenting it to a hypothetical investor. In order to prepare for the competition, students practiced their role plays based on his or her specific competition category. This could involve a mock situation as a marketing consultant or business owner. Students also take multiple choice tests based on their categories in order to prepare for the competition. Nine Homestead students officially qualified for the next level of competition, the International Career Development Conference in Orlando, Fla. Rohan Kausha, Zack Zens, Drew Braaten, Heaven Kim, Freya Salsbury, Sarah Li, Adam Garsha and Dylan Bradley and Cameron Blackwell all qualified for this next step, which will take place in April. Cameron Blackwell, senior, has participated in DECA since his freshman year. “DECA has taught me most of all the confidence and poise needed to walk into a real business meeting in a professional manner. DECA also has taught me how to fundamentally think of creative and innovative business solutions to solve real-world business problems,” Blackwell said. Blackwell is president of the Homestead DECA club. Drew Braaten and Zack Zens, juniors, serve as vice presidents of the club, with Braaten focusing on social media and communications and Zens focusing on finance. David Klein, junior, serves as the club’s executive assistant. Giovanna Fallucca, junior, recently joined the club. “I joined DECA just this year because of my growing interest in pursuing a business-related career. It is such an awesome thing to be a part of and so beneficial in obtaining useful skills for my future,” Fallucca said. Zens also commented about the valuable skills he has gained through DECA. “I would say the biggest skill would be having the courage in your convictions. Having the courage and the determination to articulate what you believe is an invaluable life skill. DECA has only grown this skill in me,” Zens said.